Are you now saying that there should be 3 of 10 plus 3 more features - i.e. 6 features? ... Yes, next to the dermatoglyphics three other 'perspectives' of the hand require to be involved. Interesting long list of possible combinations to select from. My interest in the combinations would be a process of elimination. By knowing the hand features that combine in mental illness is equally helpful in understanding those that are not mentally ill. Unfortunately, many of the features in the lists, individually, are not abnormal. What do you mean by 'lack of expression'? The 2 hand samples that you have shown, have recognizable combined features that would stand out as belonging to people that are not normal. To a trained eye, no lists are needed. The features in your lists can be combined and still be on normal individuals. As you mentioned, the a-b ridge count is probably the most significant as well as disassociated ridges. 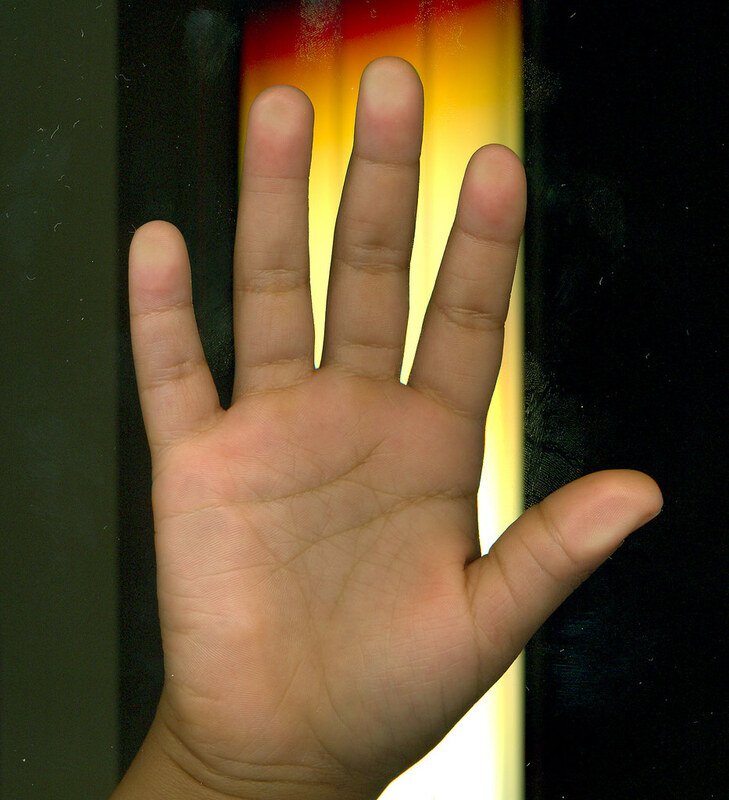 The range of movement and rotation of the index finger is greater than the other 3 fingers and is possibly a factor in the differences between the two hands during development. It (a-b difference) could represent a difference in size (or timing of dg development) between the two volar pads. NOTICE: Four of this TOP 10 hand signs relate to the fingertips, and four relate to the lines. Combinations of these 10 features should raise red flags... but I would recommend to look for significant hand signs in at least 4 dimensions of the hand before one can link such combinations with schizophrenia (as described by the requirements described in the section 'How to make a hand-diagnosis for schizophrenia'). I had a neighbour who was diagnosed as schizophrenic, he has been medicated to control it for the past 8 or more years. I happen to have his palm photos. What I noticed at first was the double life line. I agree, the double head line is the most obvious for his condition because the personality is always a bit different when someone has two head lines (or two of any line for that matter). His hands are very chunky but only because he became overweight from his medication and lack of energy or will to work (or be physically active). Yes, significant irregularities in the head- or heart line are quite commonly seen in the hands of schizophrenics - though in isolation this characteristic can not be used as a reliable indicator. PS. I observe rather large fingerlength asymmetries in these photos: in the right hand the pinky finger appears to be very strong (almost likewise strong as the index finger) - while in the left hand the pinky finger appears to be weak. 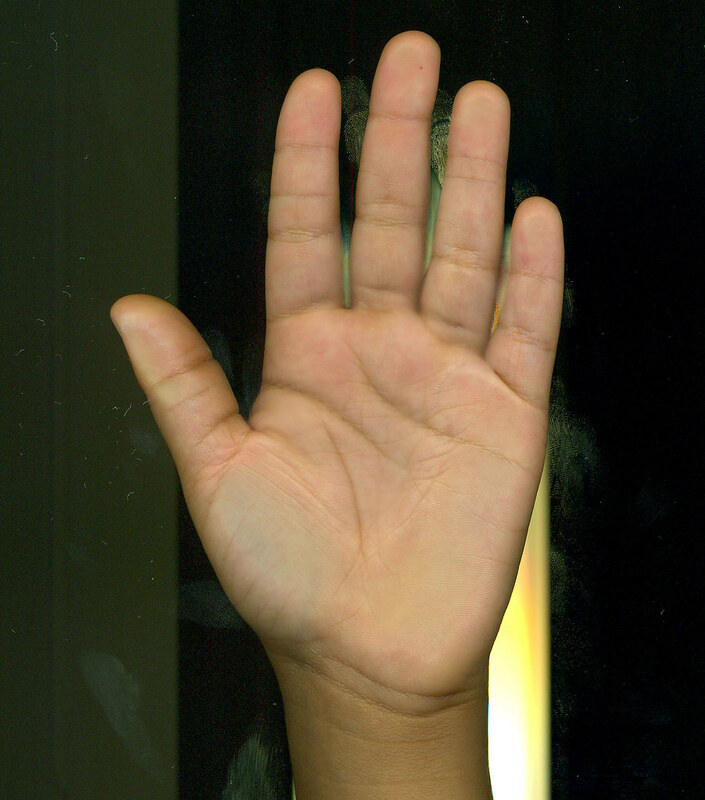 Plus a low 2D:4D digit ratio in the right hand and the high digit ratio in the left hand. (Though, I am not sure that the 'position of the camera' is not involved in these asymmetries). Thanks, I think you are right even though the photos are a bit iffy, the fingers are pretty much as you see them, It was a few years ago when I took those photos and he was kind of skeptical about me taking the photos, or letting me read his hands for that matter. I only got to have a quick look and so can't remember much of anything else specific. I do know that he paints to keep busy and is quite a talented landscape/beach painter (oils on canvas). A very easy going likeable person. 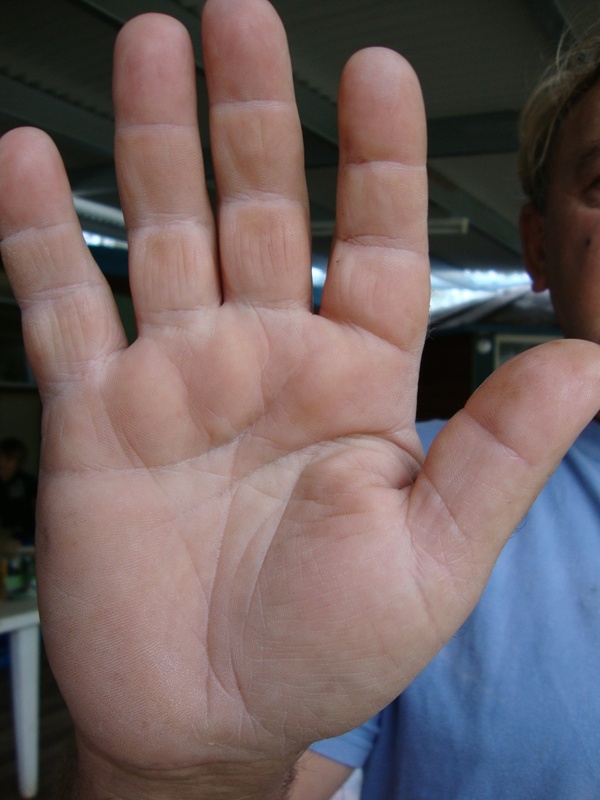 As we have pictures of a person’s palms who was diagnosed as suffering from schizophrenic. According to Sari he has been medicated to control it for the past eight or more years. She happened to have his palm photos. I thank her for posting the pictures. Now, can someone show how many hand signs or features he/she recognizes there in the pictures which can indicate schizophrenia? Martijn has given a link to go there and look at but it is very difficult to tally with the palm features with them as for applying those guidelines, one must have some experience in this regard. I am not sure what you have in mind with your request... but I assume that your request relates to the photos presented by Sari. Correct? Can you specify what you exactly have in mind with your request? Since my observation is that Sari's photos are not suitable for studying most of the 37 hand signs that I have included in my list. ... Again, can you please specify? Yes, obviously, my request was related to the photos presented by Sari. I found the answer when you wrote: " Sari's photos are not suitable for studying most of the 37 hand signs that I have included in my list." Its Okay and Thank you. Yes, this might in a way be very true. For example, autism is typically featured with a low '2D:4D digit ratio' (= usually a relatively long ringfinger)... while schizophrenia studies have shown that a 'female' finger ratio (2D:4D digit ratio > 1) is more common among schizophrenics. Prof. John Manning described these tendencies in his book 'The Finger Book' (2008). Roosi, thanks for adding the link! Schizophrenia and autism probably share a common origin, hypothesises Dutch researcher Annemie Ploeger following an extensive literature study. The developmental psychologist demonstrated that both mental diseases have similar physical abnormalities which are formed during the first month of pregnancy. Thanks so much for posting that. I,personally, found if very interesting. Following are the two pictures of a female child of five years. Can we see any symptom or sign of autism and schizophrenia in the pictures? I notice the outstanding feature of her hands is this that her right ring finger is longer comparing with the right index finger. This is not normal condition on a normal female hand. In female hands both the fingers are found just of equal in length and that there are on her hand index finger has four phalanges. This can lead her to autism and/ or schizophrenia? What are other symptoms if any present on her palms of the hands ? Thank you. Thank you for adding these hands. I wish I could see the dermatoglyphics! It appears she may have a lunar whorl, from the appearance of the small 'bump' in right hand. - The ending of her head line in the right hand is also interesting. It is met by an incoming crease that extends the head line to the percussion. In some accounts this would fall into a Sydney Crease category. - These two 'pieces' of the head line are divided by the 'health or mercury' lines. I would read this as relating to attempts at trusting gut feelings - physical sensations - to make moment to moment decisions. - Extended chained start to head line - connected to life line - indecisive - insecure - lack of concentration or restless mind. - Wide distance between head and heart lines - very open to suggestion - lack of strong preferences. - Thumb sunken where it casts off from palm. Fear, but deep seated, not immediately apparent. - Ring finger extra distal interphalangeal crease. Short proximal phalange. Finger appears slightly sunken at cast off from palm. - Life line becomes deep and dark far into the hand and not close to radial edge. - Chained and dark head line. - Short downward branches from heart line. From what I've read autism and schizophrenia have patient specific symptoms and diagnosis. To me this would mean that each individual would have their own unique combination of features that relate to how they perceive and function in this world. What I'm picking up from the combination of features in this girl's hands is that she is continuously using her physical senses - to interpret the world around herself. In autism, they say that the person doesn't respond to other people's emotions, yet this girl appears to have a heightened level of sensitivity to her own sensations. I cannot tell for sure from the photos if this is other people related or self contained. How she holds her thumbs and ring fingers imply inward and self absorbed. Yet her life lines and stance of the index fingers imply she is outgoing in personality. Which is her dominate hand? What are her fingerprint patterns? How many triradii per hand? What is the condition of her fingernails? Thanks for presenting your questions, but your words are a bit ambiguous: is this a person which has a diagnosis for autism and schizophrenia? EDIT: The requirements B + D are met... but the requirements A + C not met, so these combinations are not enough to associate the hands of this girl with schizophrenia. 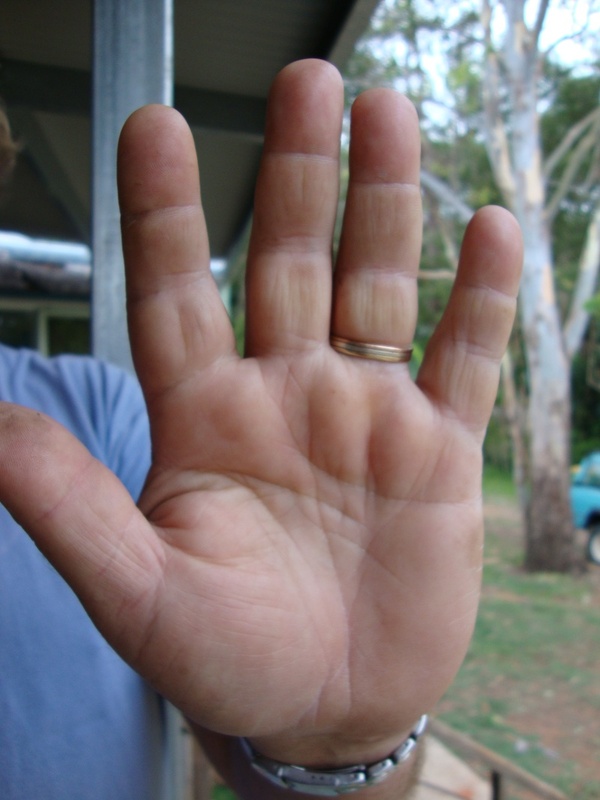 And finally, I also agree with Patti about the unusual 'interphalangeal crease' in the right hand: an extra crease in the middle phalanage of the index finger, plus displaced creases on the ring finger. I can not specify the significance of these creases for autism or schizophrenia, but these can definitely be recognized as a 'minor physical anomaly' - and therefore the might provide a link to explain the rather complex behavior problems of this girl (assuming that she does show tendencies towards both autism and schizophrenia...?). Though it's not a whorl, the small bump in the right hand is here featured with a proximal loop on the mount of moon (with two distally placed triradii). I am very much thankful to you both Patti and Martijn for your time and attention and for the detailed explanations. Here is the reverse side picture of the child’s right palm where we can look at her nails as nails are important factor in deciding the autistic or schizophrenic spectrum. No, she is not having or showing any impairment in communication or language at present; she is learning two languages. I want to know as her mother’s concern is that if we can assume that in future as an adult, whether she would become aware or not that she probably fell on the autistic or schizophrenic spectrum. My particular question is only relating to autistic or schizophrenic spectrum. This is not normal condition on a normal female hand to have ring finger longer than index. In female hands both the fingers are found just of equal in length and that there are on her hand index finger has four phalanges. She was of the opinion that her daughter has whorl on moon mount. She fears these symptoms can lead her to autism or schizophrenia spectrum later in her life. I think she will not show tendencies towards both autism and schizophrenia in future, even she has longer ring finger on her hands! What do you think? Thank you once again Patti and Martijn. It appears then that this little girl is probably normal but has a fearful mother. Is it possible the markings that I described as fearful, indecisive and insecure may be caused by the mother's worrisome nature?